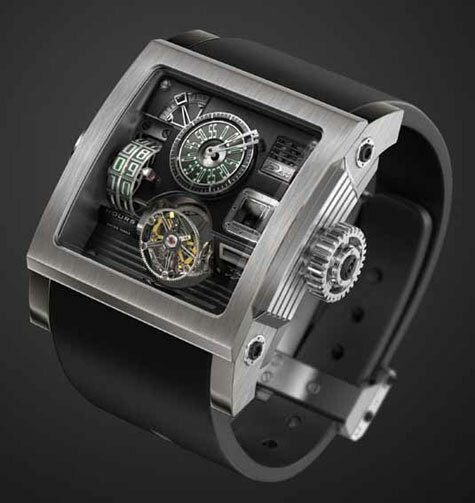 A former concept watch called the Vulcania has become flesh and bone. Designed by Fabrice Gonet for the three year old brand HD3 Complication. A trio-collective started by Jorg Hysek where he, Gonet and Valerie Ursenbacher design watches from their wildest imaginations. The Vulcania name derives from the Jules Verne Steampunk hero, Captain Nemo and the island which was his home port. Like many of his contemporaries, Gonet has deconstructed the watch with its functions in a deeply set three-dimensional display, separating each gauge as a tribute to vintage naval technology both fictional (Nautilus) and fact (Turn-of-the-century mechanical submarines).